What Are Uveitis and Iritis? Uveitis is the inflammation of the middle layer of the wall of the eye, the uvea, and is the third leading cause of blindness in the United States. The uvea extends between the sclera, the white of your eye, and the retina, the light sensitive area at the back of your eye. The uvea itself is comprised of three parts: The iris, the ciliary body, and the choroid layer. Inflammation in any part of the uvea is called uveitis. However, when the inflammation occurs in the iris, the colored ring in the center of your eye, this is called iritis. You may also see other names associated with uveitis. Anterior uveitis is another name for iritis, since it involves the front of the eye. Intermediate uveitis affects the middle portion of the uvea, the ciliary body. Posterior uveitis is inflammation at the back of your eye and most commonly involves the choroid layer. This can also be called choroiditis. 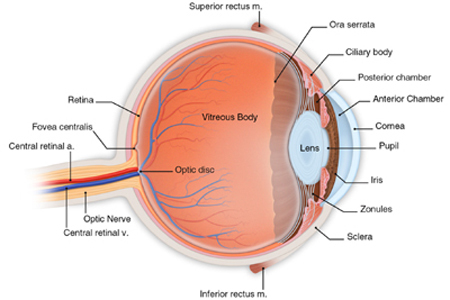 If the retina is also inflamed, it is called chorioretinitis. Uveitis can be a result of an infection, caused by a virus, bacteria, fungus or microorganism. In addition, uveitis and iritis can be caused by an auto-immune response. In the latter situation, a person’s body responds to a stimulus which it perceives as a threat by producing leukocytes (white blood cells) to fight the threat. This causes the inflammation in the eye which is fighting the perceived threat. In many cases of chronic uveitis and iritis, the inflammation is in response to a systemic disease such as lupus, rheumatoid arthritis, and HIV / AIDS. Uveitis can also be a result of an ocular trauma or surgery. However, in approximately 50 percent of uveitis cases, there is no known cause of the inflammation. These cases are called “idiopathic”. If you have any of the symptoms highlighted above, you should see your eye doctor as soon as possible, usually within 24 hours of onset of symptoms. Symptoms of anterior uveitis and iritis usually occur in one eye and may develop quickly. With intermediate or posterior uveitis, you may experience little or no pain, and the blurred vision and floaters may appear in both eyes. Treatment for uveitis can include steroid drops, oral medications and injections. Untreated uveitis and iritis can lead to permanent vision loss caused by scarring in your eye. The magnitude of vision loss depends on the degree of scarring as well as where the scarring is located. Uveitis can also lead to vision threatening complications including uveitic glaucoma, cataracts, and macular edema. Who Is at Risk for Uveitis and Iritis? Because approximately 50 percent of the cases of uveitis are of unknown cause, we are all at risk for this eye disorder. Intermediate uveitis is most likely to affect people in their 20s and 30s. How Are Uveitis and Iritis Detected? If your doctor believes that your uveitis or iritis may be caused by an infection or systemic disease, he will order lab tests or X-rays to determine the etiology. How Are Uveitis and Iritis Treated? Treatment of uveitis depends upon the location and severity of the inflammation, as well as its cause. Anterior uveitis and iritis are most commonly treated with steroid eyedrops. Intermediate or posterior uveitis may be treated with a combination of steroid eyedrops, oral medications, and / or injections. To reduce pain, your doctor may also prescribe another type of eye drop that will dilate your pupils. Both steroid eyedrops and oral steroids are powerful medications that are effective in reducing inflammation. However, because of potential complications, long term use is not advised. Since steroid eyedrops can raise your intraocular pressure, long term use can lead to complications such as glaucoma and cataract. Therefore, careful monitoring of your eye will be required during treatment. If testing determines that the cause of your uveitis / iritis is either a bacterial or fungal infection, additional medication may be prescribed. This could include antibacterial or anti-fungal eyedrops, ointments, oral medications, or even intravenous injections. Uveitis and iritis can recur, particularly if they are associated with an underlying systemic disease. Treatment and management of the disease is necessary. Your eye doctor will work closely with your medical specialist to effectively treat the inflammation in your eye. In some severe cases of uveitis, this may require treatment with immunosuppressant medications. In most cases, uveitis will resolve with treatment after about two weeks. However, it is possible for the uveitis to recur. If the uveitis is caused by an infection, prompt treatment with antibiotics will address the symptoms within two weeks. In such cases, recurrence is unlikely. For severe cases of uveitis, a therapeutic injection of triamcinolone acetonide may be recommended. This injection may be applied around the outside of the eye or directly inside the eye. Triamcinolone acetonide is a type of corticosteroid hormone that has been used for years to treat many diseases including eye disease, allergic reactions, arthritis, and skin diseases. This medication can be very successful in reducing swelling and inflammation in the eye. Our highly skilled retina specialist gives these therapeutic injections. Your eye will be numbed for the procedure so that you are comfortable, and the medication will be injected. Following the procedure, you may experience some mild discomfort in or around the eye. Most patients undergoing intravitreal injections will also experience “floaters”, black spots floating across the eye for a couple of days. The most common side effects are blurry vision, redness, and sensitivity to light. Eye injections can also increase your eye pressure. However, the positive effects of reducing inflammation, preventing damage to the retina, and preserving your vision normally outweigh the risks. Although infection rarely results from an injection, you should notify your doctor immediately if symptoms such as pain or progressive decreased vision should develop in the days following treatment. While highly unlikely, if you should experience a sudden onset of floaters or flashes in your eye, this can be an indication of a detached retina. Therefore, you should also notify your doctor. Because iritis and uveitis can lead to vision loss and even blindness, it is important that treatment begin as early as possible. If you experience pain, redness, blurred vision, light sensitivity, or new floaters, call your eye doctor immediately.